CHICAGO (March 12, 2015) — In its 30th year of honoring the nation’s best high school athletes, The Gatorade Company, in collaboration with USA TODAY High School Sports, today announced Ali Patberg of Columbus North High School as its 2014-15 Gatorade Indiana Girls Basketball Player of the Year. 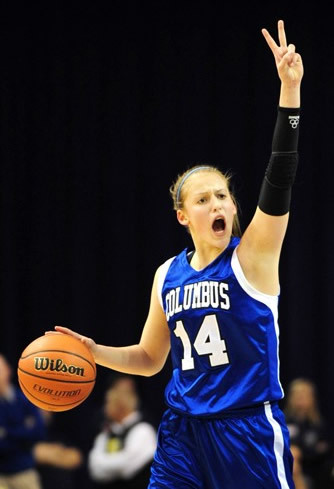 Patberg is the first Gatorade Indiana Girls Basketball Player of the Year to be chosen from Columbus North High School. The award, which recognizes not only outstanding athletic excellence, but also high standards of academic achievement and exemplary character demonstrated on and off the court, distinguishes Patberg as Indiana’s best high school girls basketball player. Now a finalist for the prestigious Gatorade National Girls Basketball Player of the Year award announced in March, Patberg joins an elite alumni association of past state girls basketball award-winners, including Candace Parker (2001-02, Naperville Central HS, Ill.), Diana Taurasi (1998-99 & 1999-00, Don Antonio Lugo HS, Calif.), Maya Moore (2005-06 Collins Hill HS, Ga.), Rashanda McCants (2004-05, Asheville HS, N.C.), Shyra Ely (1999-00, Ben Davis HS, Ind.) and Lisa Leslie (1988-89, Morningside HS, Calif.). The 5-foot-10 senior guard led the Bull Dogs to a 28-1 record and the Class 4A state title this past season. Patberg averaged 25.9 points, 8.8 rebounds, 6.1 assists and 3.1 steals per game, including 31 points and nine rebounds in the state championship game. A McDonald’s All-American Game selection, Patberg was a Naismith Girls High School Player of the Year Award semifinalist. The No. 14-rated recruit in the Class of 2014 by espnW, she concluded her prep basketball career with 2,026 points. Patberg has maintained an unweighted 4.07 GPA in the classroom. A member of the Columbus North High Student Assembly, she has volunteered locally as a youth basketball coach and as part of multiple community-service initiatives in association with her church youth group. Patberg has signed a National Letter of Intent to play basketball on scholarship at the University of Notre Dame this fall. Patberg joins recent Gatorade Indiana Girls Basketball Players of the Year Whitney Jennings (2013-14, Logansport High School), Stephanie Mavunga (2012-13 & 2011-12, Brownsburg High School), Bria Goss (2010-11, Ben Davis High School), Courtney Moses (2009-10, Oak Hill), Skylar Diggins (2008-09 & 2007-08, Washington), and Ta’Shia Phillips (2006–07, Brebeuf Jesuit Preparatory School) among the state’s list of former award winners.